Pass the Hash is a fundamental function of Windows for remote administration which will be taken care by the LSASS process (User Mode Process responsible for Authentication and Isolation of users).LSASS is a User Mode Process manages the hash that needs to be passed for remote administration. 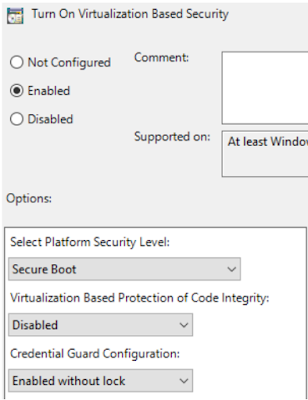 Upon Enabling Credential Guard, the Local Security Authority Subsystem Service (LSASS.exe) runs sensitive codes in Isolated mode as an Isolated LSA Process (LSAISO.exe) to protect the NTLM and Kerberos Codes. VSM leverages the Hyper-V Hypervisor and Second Level Address Translation (SLAT) Features to create isolated Virtual Trust Levels (VTL) or Modes. - SLAT is a hardware CPU feature leveraged by Hyper-V that helps to reduce the overhead of virtual to physical memory mapping. - VTLs are numbered and higher the number, more secured is its memory space. When the Machine Boots, “bootmgr.efi” is validated by Secure Boot and loaded. 6. LSAISO.exe communicates with LSASS.exe over a secure encrypted Remote Procedure Call (RPC) Connection. 7. All the secure/trusted processed (Trustlets) which includes NTLM Hashes and Kerberos Tokens runs only in the Isolated User Mode thus preventing is from being stolen. -Even if the Normal Kernel mode of VTL0 is compromised, it cannot access the secure pages in IUM. -The Secure kernel cannot be extended or in other words we cannot create a secure driver to run in Secure kernel and run malicious codes in the isolated user Mode (Microsoft Can perform it). -Also, it’s not possible for Normal Kernel drivers to load DLL into IUM (Isolated User Mode) Process for threat injection. 1. Install the Hyper-V Role. 2. Turn on the Device Guard as below. 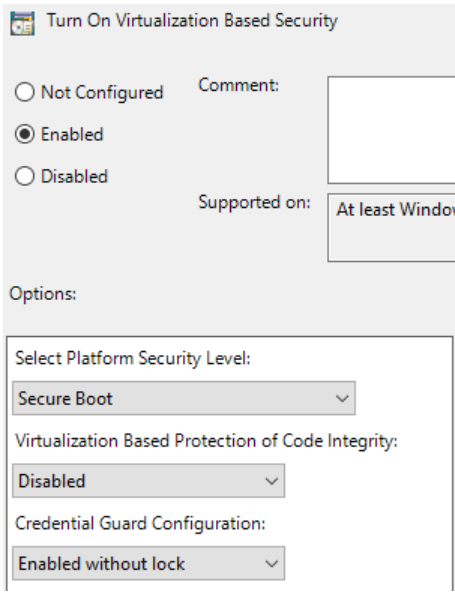 Computer Configuration > Administrative Templates > System > Device Guard >> Edit the policy “Turn on Virtualization Based Security”. After Enable, we can verify the new LSAISO.exe status from Task Manager. More: Read Arjun's article on Microsoft Windows NLB Feature for Stateful Applications here.